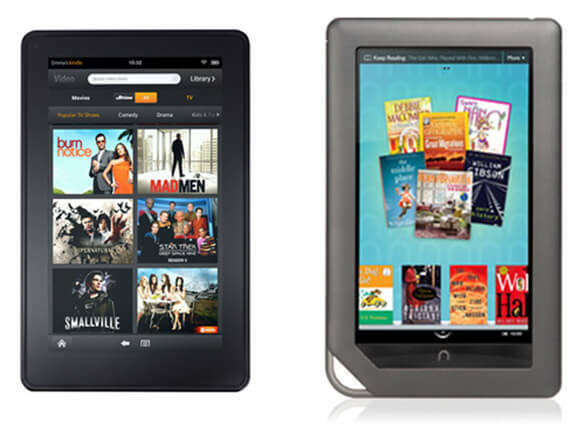 Home (All Topics) → Technology → iPad vs. Nook 2 vs. Kindle Fire: Which Is Better for You? iPad vs. Nook 2 vs. Kindle Fire: Which Is Better for You? Since starting my new job I've been on a reading binge. I've closed out 2 months with this company and I've already read 9 books. That also happens to be 9 more books than I've read over the last 12 months. What's amazing to me is that all of this reading is happening during my commute to and from work. I used to spend this time poking away at my laptop — not necessarily accomplishing anything, but often just killing time. As a result of all of this reading, I've been considering getting an ereader or a tablet. I'm not a rabid-fan of Apple. It's not that I have a problem with Apple products, but rather I'm more interested in buying what will suit me the best rather than because of which company made it. Having said that, I did consider the iPad. My conclusion is that it's expensive and is intended to be a general use device — practically a laptop replacement. I, on other hand, just want to read books and PDFs with the occasional web browsing. Anything more complicated and I'm going to open my laptop since having a keyboard is critical to my efficiency. So out goes the iPad. What's left are the two dominant ereaders on the market: Barnes and Noble's Nook Color 2 (aka Nook Tablet) and Amazon's Kindle Fire. Sadly, choosing even between just two devices still isn't easy. The Kindle Fire has Amazon's impressive content library which, while I can't verify, is undoubtedly larger than Barnes and Noble's although according to CNN looking at absolute numbers of titles, Barnes and Noble isn't that far off. And, just based on the 9 books I recently read, BN's library is as comprehensive as I'll likely need it to be. In terms of important specs, both ereaders are remarkably similar — same screen size, same resolution, and same underlying operating system. There is one feature difference that is important to me and that is storage — both built-in an expandable. In this area the Nook 2 wins hands down with twice as much onboard storage than the Kindle Fire and an expansion slot. Being able to expand the memory or swap out cards seems like it would be pretty handy. And if I can figure out a way to view photos on the Nook by copying files from my camera to a card I could pop into the the ereader, that would also be very useful when traveling. So after all of this musing I've come up with a quick way to decide what device is best for you. Does the iPad's starting price of $499 seem like a lot to you? If yes, consider a Kindle Fire or a Nook Color 2. They're both at least 50% less than what you'd pay for a base iPad and an even better deal if you buy one of the pricier iPad models. If no, get an iPad. You'll avoid all of the device-envy you'll otherwise suffer. Is reading the primary reason you are looking to buy one of these devices? If yes, a Kindle Fire or Nook 2 is your best bet. They're designed for reading whereas the iPad is not. If no, an iPad is better for general purpose use. If you're leaning towards an ereader, do you think you'll need more storage because of PDFs or videos you'll want to have at your fingertips? If yes, buy the Nook. If no, you might as well save yourself a few bucks and get the Kindle. See, it's not so hard after all!